Old-world craftsmanship with impressive finishes. 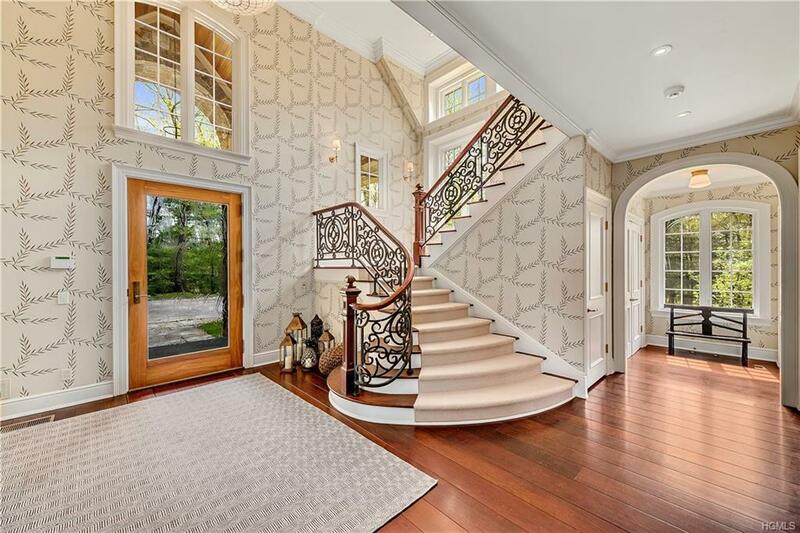 Gleaming hardwood floors, graceful arches, extensive millwork and great ceiling height and room proportion. Visually stunning spaces with approximately 7800 square feet of living space. Entrance Hall with magnificent staircase. Spectacular Living Room with herringbone brick fireplace and four sets of French doors to the rear terrace. Formal Dining Room with coffered ceiling. Butlers Pantry. Chefs Kitchen. Breakfast Area with Fireplace. Family Room with vaulted, beamed ceiling and Fireplace. Private First Floor Master Suite with Sitting Room, Dressing Room and opulent Bath. Four additional Bedrooms plus Au Pair. Recreation Room. Wine Cellar. Every amenity including a generator. Over four professionally landscaped acres. Tiered terrace with fireplace and outdoor kitchen overlooking the salt-water Pool with Spa. Perfectly sited Tennis/Sport Court. Estate area next to Caramoor Center for the Arts. Listing courtesy of Mary Dowdle of Ginnel Real Estate.